For information on the availability of ThorImageOCT version 5.0, please contact our OCT Support Team. 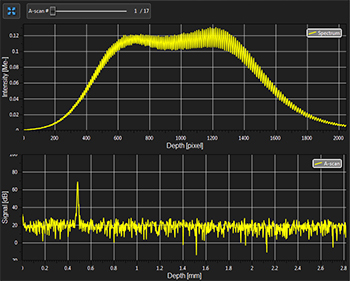 ThorImageOCT is a high-performance data acquisition software, which is included with all Thorlabs OCT systems. This 64-bit Windows-based software package performs data acquisition, processing, scan control, and displays OCT images. Additionally, NI LabVIEW and C-based Software Development Kits (SDKs) are available, which contain a complete set of libraries for measurement control, data acquisition and processing, as well as storage and display of OCT images. 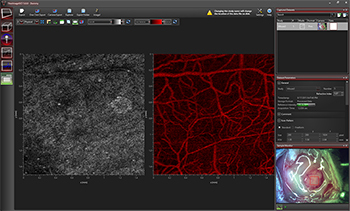 The SDKs provide the means for developing highly specialized OCT imaging software for every individual application. Various acquisition parameters can be adjusted in ThorImageOCT. 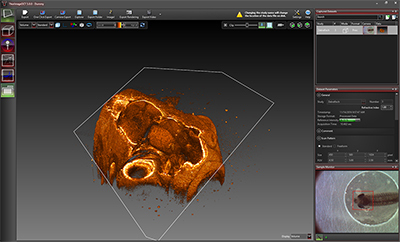 ThorImageOCT provides numerous scan and acquisition controls. The camera integrated in the scanner of our OCT systems provides live video images in the application software. 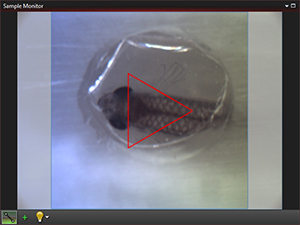 Defining the scan line for 2D imaging or the scan area for 3D imaging is accomplished through the easy-to-use "Draw and Scan" feature by clicking on the video image. 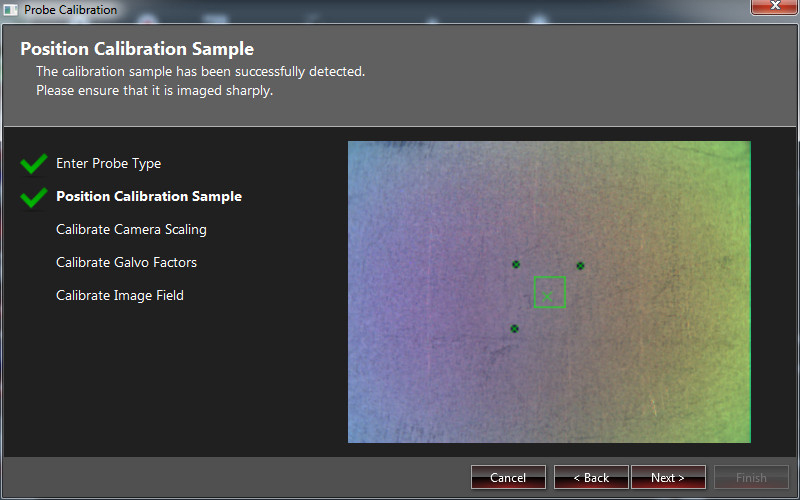 The Sample Monitor can be used to define the scan pattern using the "Draw and Scan" feature. With version 5.0, a new freeform scan pattern feature has been implemented. Arbitrary forms defined by the Draw & Scan feature or loaded .txt files can be scanned. The scan pattern can also be adjusted by specifying suitable parameters in the controls of the software, as shown to the right. A predefined circle scan pattern can be loaded and scanned in the software. The size can be changed with the Zoom feature. A predefined triangle scan pattern can be loaded and scanned in the software. The size can be changed with the Zoom feature. Additionally, one can further set processing parameters, averaging parameters, and the speed and sensitivity of the device using device presets. By using a high-speed preset, video-like frame rates in 2D and fast volume rendering in 3D are possible, whereas high-sensitivity acquisition is enabled by choosing a preset with a lower acquisition speed. The Dataset Management Window of ThorImageOCT. ThorImageOCT provides advanced dataset management capabilities, which allow opening several datasets simultaneously. Datasets are uniquely defined using an identifier consisting of a study (or test series) name and an experiment number. Grouping of datasets can be achieved by using the same study name. The "Captured Datasets" list shows an overview of all open datasets, including the dataset identifier, the acquisition mode, and preview pictures of the still video image and the OCT data. Datasets can be exported in various image formats, such as PNG, BMP, JPEG, PDF, or TIFF. The set can also be exported in complete data formats suited for post-processing purposes, such as RAW/SRM, FITS, VTK, VFF, and 32-bit floating-point TIFF. The OCT file format native to ThorImageOCT allows OCT data, sample monitor data, and all relevant metadata to be stored in a single file. ThorImageOCT can also be installed and run on computers without OCT devices in order to view and export OCT data. The user has full access to the raw and processed data from the device, including additional data used for processing, e.g. offset errors. If both ImageJ and ThorImageOCT are installed on the computer, opening acquired OCT data in ImageJ is one mouse click away. This enables a flawless workflow when requiring the advanced image processing functionality provided by ImageJ. Clicking the Explorer button will open the folder and select the file in Windows Explorer where the currently active dataset is stored. Export buttons are accessible in the Action Toolbar of ThorImageOCT. Different OCT imaging modes can be selected using the mode selector. If the ThorImageOCT software finds a compatible system connected and switched on, all operational modes will be selectable. If no OCT device is present, only the data viewing mode for viewing and exporting OCT data will be available. Several A-Scans at a single point overt time, also known as an M-Scan. Spectral and depth information for a single point. The 1D Mode provides the possibility to measure at a single point. The single point measurement not only provides spectral information and depth information, but also gives the possibility to observe time related behavior of a sample with an M-Scan. 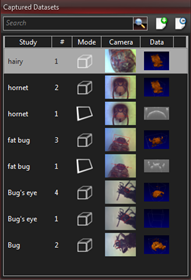 The ThorImageOCT window in the 2D Mode. In the 2D imaging mode, the probe beam scans in one direction, acquiring cross-sectional OCT images which are then displayed in real time. 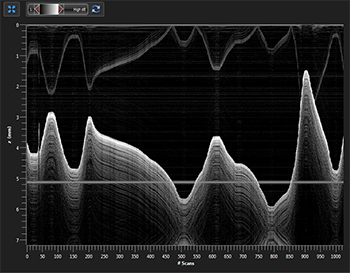 Line averaging before or after the Fast Fourier Transform (FFT) is available, as well as B-Scan averaging. Image display parameters, such as color mapping, can be controlled in this mode. We have also implemented an option for automatic calculation of the optimum contrast and brightness of the displayed OCT images. In the 3D imaging mode, the OCT probe beam scans sequentially across the sample to collect a series of 2D cross-sectional images which are then processed to build a 3D image. 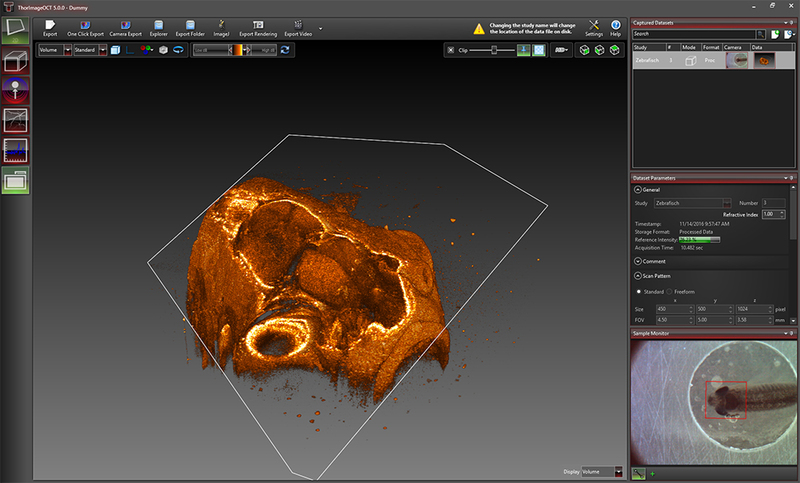 In the ThorImageOCT software, 3D volume datasets can be viewed as orthogonal cross-sectional planes (see below) and volume renderings. The Sectional View features cross-sectional images in all three orthogonal planes, independent of the orientation in which the data was acquired. The view can be rotated as well as zoomed in and out. 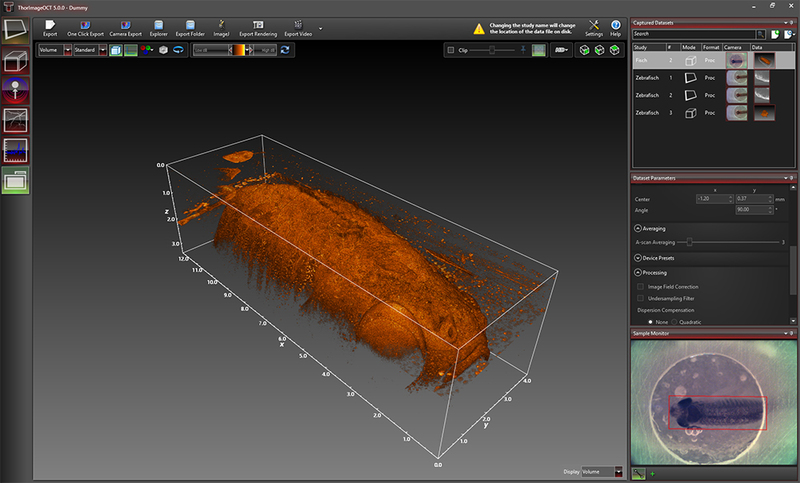 The Rendering View provides a volumetric rendering of the acquired volume dataset. This view enables quick 3D visualization of the sample being imaged. Planes of any orientation can be clipped to expose structures within the volume. 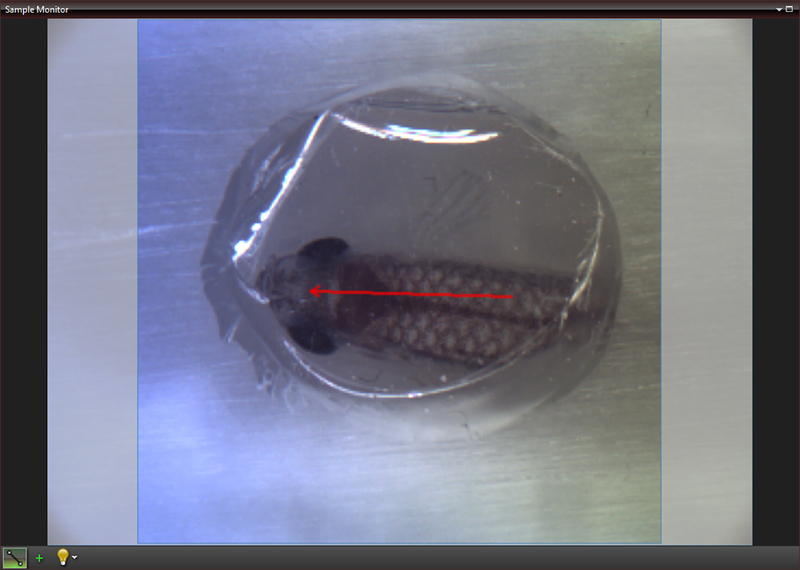 The 3D image can be zoomed in and out as well as rotated. Furthermore, the coloring and dynamic range settings can be adjusted. Utilizing the full potential of our high-performance software in combination with our high-speed OCT systems, we have included a Fast Volume Rendering Mode in the ThorImageOCT software, which serves as a preview for high-resolution 3D acquisitions. 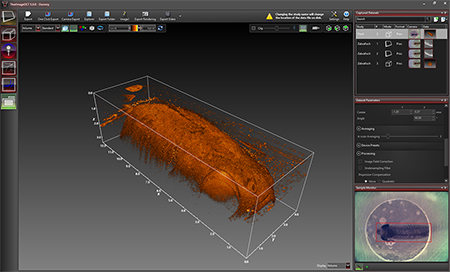 In this mode, high-speed volume renderings can be displayed in real-time, providing rapid visualization of samples in three dimensions. Doppler dataset showing the velocity of a rotated plastic stick with opposite flow directions. Doppler OCT imaging comes standard with all OCT systems. In the Doppler mode, phase shifts between adjacent A-scans are averaged to calculate the Doppler frequency shift induced by particle motion or flow. The number of lateral and axial pixels can be modified to change velocity sensitivity and resolution during phase shift calculation. 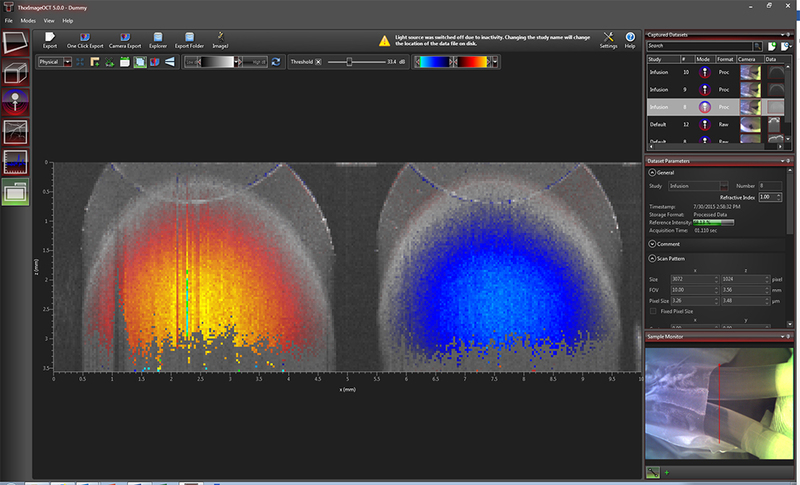 The Doppler images are displayed in the main window with a color map indicating forward- or backward-directed flow, relative to the OCT beam. 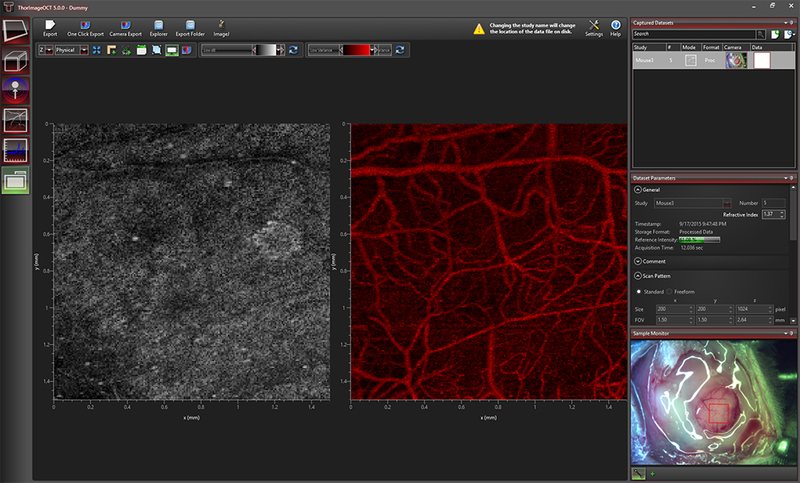 Speckle variance measurement showing blood vessels of a mouse brain. The speckle variance imaging mode is an acquisition mode which uses the variance of speckle noise to calculate angiographic images. 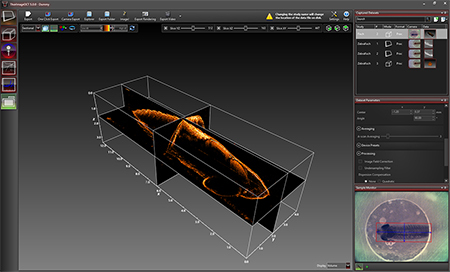 It can be used to visualize three dimensional vessel trees without requiring significant blood flow and without requiring a specific acquisition speed window. 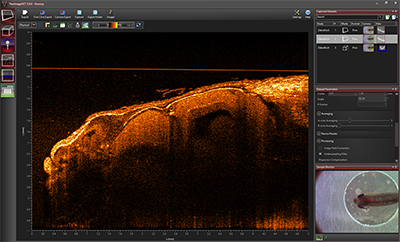 The speckle variance data can be overlaid on top of intensity pictures providing morphological information. Different color maps can be used to display the multimodal pictures. ThorImageOCT and the SDK APIs provide the ability to externally trigger the acquisition of A-Scans. This enables the user to synchronize measurements from different modalities (e.g. vibrometry and synchronized positioning) with an OCT measurement. Synchronization is greatly simplified with all current CameraLink-based Thorlabs OCT systems (a TTL level trigger signal source required). External triggering is available for all imaging modes and can be toggled in the settings dialog in ThorImageOCT. Changing to a different scan lens kit will generally require a different probe configuration in order to adapt to changes in the optical parameters of the system. When an additional scan lens is purchased for your Thorlabs OCT scanner system, ThorImageOCT enables you to easily create a fitting configuration for your new scan lens by using the calibration sample shipped with the lens and an intuitive step-by-step calibration process (shown to the right). In this video, OCT images of a finger are acquired and manipulated in the 3D volume and cross section modes.